Property 28: Attention slow down! Property 35: Renovated barn, modern and charming, terrace. COTTAGE WITH TWO DECKS, COURT AND SCENIC VIEW IN Cathar IN AUDE! Property 38: COTTAGE WITH TWO DECKS, COURT AND SCENIC VIEW IN Cathar IN AUDE! I struggle to say enough good things about this place without sounding (1) totally high or (2) like a paid spokesman (neither of which I am&mdash;really!). For a history buff like me, there&rsquo;s something very special about staying in a stone-masonry house built hundreds of years ago and likely to be there hundreds of years later. First floor: convenient, we&rsquo;ll-our-fitted, totally updated kitchen and bathroom. Upstairs: comfortable bed, high ceilings, beautiful terrace. All in the middle of a friendly village where I had the pleasure and good fortune to spend a week and was still sorry to leave. 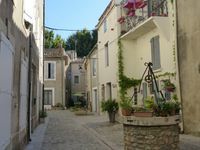 A lovely well maintained cottage, with large gardens and a pool to relax in Upon arrival we were met by Serge, Marie and Anais and enjoyed snacks and drinks with them before moving in to our Gite. Friendly and co-operative hosts that nothing was to much trouble. They ensured our stay was relaxing and just what we had hoped for. Peaceful walks around the area and the 12th century stone bridge a must see. Situated on the edge of a small quite, except for the clock tower bells, friendly rural town. Thank you Serge, Marie and Anais for allowing us to stay.